Well if they claim to be the biggest and best, it must be true. Luckily we know in this day of dubious claims, at least we can feel certain about anything that we find on the Internet. Depends on how bad they ruin your health. I'm in the intercontinental having Sunday Brunch with Foi Gras for a cost of over 2000baht. Eat your hearts out you filthy peasants. Ban Noks all of you. I think I'll have some caviar now. 1000b (for two) with a voucher from many online merchants. Ate at IC a few times. Not the greatest brunch and full of Chinese picking decorations from a cake and eating it on the spot. You must have a huge house with central air and a huge garden that requires a live-in gardener for those rates. Or someone is paying your bills for you and skimming. My gardeners charge us 400 baht each time they come (that's for 4-6 people), about every 3 weeks when it's rainy (less when it's not). New car would be that much if you include lease payment but now it's paid off could do with 1k per month fuel and 10-15k per year maintenance. Electricity is about 2k per month with two air conditioned bedrooms, a bit less when it's cool and we open the windows some nights. When I was going to school I survived on 14k per month after I paid tuition and I still had enough for the occasional pint. Some expenses are unavoidable, but we all make lifestyle choices too. "...The website said the monthly costs for a single person to live in Bangkok was 21,017.40฿ without rent..."
21,017 a month WITHOUT rent? What the hell do people do in Bangkok that is so expensive? I live on Koh Samui, modestly but comfortably, for around that much including rent. Many people living in Bangkok, and other cities will drink alcohol which is expensive, possibly smoke which is still pretty cheap here, and dine out in restaurants in the Malls or large Hotels. Do that a few times a week and the expense shoots up. Not everyone is comfortable eating at the roadside restaurants or from street vendors; and many don't like to cook or eat meals at home. We don't eat out so much as we used to because the costs have noticeably increases. We don't drink alcohol which helps keep the costs acceptable. It's easy to spend money, depending of life-style; even one don't smoke or drink alcohol. Yes, I could live for less – including rent – at Samui, when living a simple life; we could actually live two grownups for little under 25,000 baht a month, and I smoked a bit (tobacco) at that time. Today it's hard to "survive" for 50,000 baht a month only for two grownups and a teen – without rent, and school expenses, and any extras, but including transportation in/on fully paid vehicles – presume we have upgraded our life-style, but we don't smoke, and only occasionally enjoy a glass of normal "healthy" wine for dinner at home (we otherwise almost never drink alcohol). But if you for example look at food choices, you can live from next to nothing – like many Thais do, or need to – to spending a minor fortune, or at least a double-up on the food budget, or lack of same. Do you for example buy chicken, pork or beef? ; do you buy affordable fish, or is seafood instead musles and oysters? ; potatoes and gourmet bred instead of rice? 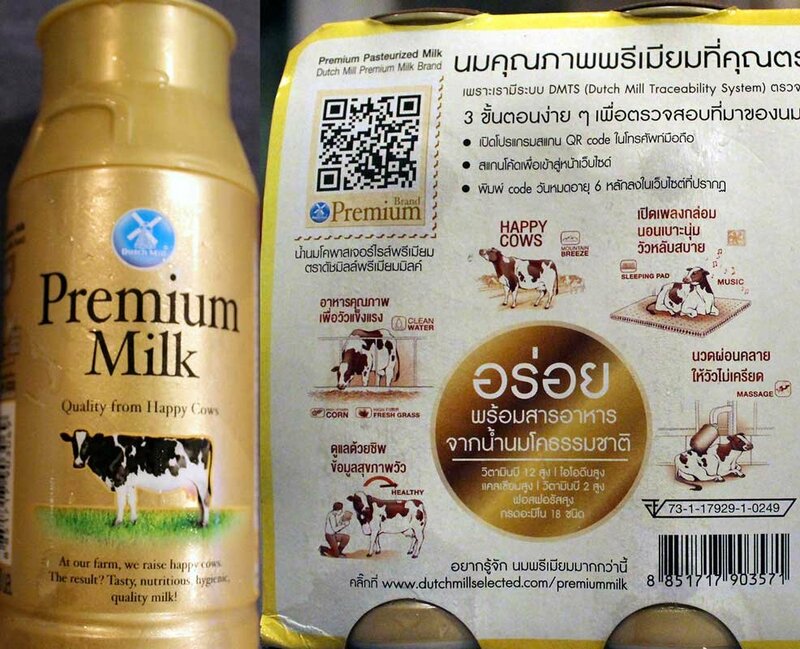 ; even plain milk is available in superstores as high end double-priced product from "happy cows that listen to music and get massage" (we've tried it, and it actually taste better, but that might be mind placebo, as it has to taste better for that price); etc. Don't see what's hilarious there. Numbeo is an excellent resource, that reconciles inputs collected from its users. Bottom line is for a normal middle class life I'll need 200k, since we are still improving the house I am still denting my savings. and I have given up on the pool. Seriously, wife allowance? Is this a joke? I have watched my standard of living being eroded over fifteen years. My state pension has been frozen by the UK Gov. Thailand continues to inflate prices for staple food stuffs/services. I am teetering on the brink of emigrating - new Immigration rules may push me over the edge. It's largely the Wall Street play on commodities years ago that sent food prices soaring and of course they never returned to where they were.... now add to that inflation and it has screwed a lot of people particularly Thais. No Chinese today Mr. Oliver Twist. Come on man! IC and the adjacent Holiday Inn is like San Francisco Chinatown - every single day. Are we talking about the same Inter Continental? "Many of the destinations popular with expats and foreign retirees to Thailand are some of the most expensive cities to live in ASEAN." And best of all, retirees get to deposit into a Thai bank 800,000 baht, which does not accrue interest, for the privilege of living among people who love and appreciate how much they contribute to the local economy. That is just a normal good life lived but nothing fancy at all and the baby costs will eventually go up big time with school on top. I do have to say that the rent is really cheap and it is a brand new house. Could it be cheaper? I think we could survive with 30k if needed but it would not be fun. Also this does not include my personal trips and parties in BKK / elsewhere or other bigger spendings that come from time to time. At least 90k a month needed to also do some proper saving and investing. A couple of off-topic troll posts have been removed. So that's 8kB compared to your 81kB, plus I get free peace and quiet thrown in. I'm rather glad I dont live in an Isaan house with a Thai family of 4.